We need your help to provide free of charge hospice care to individuals in need. While we receive financial support from the North Simcoe-Muskoka Local Health Integration Network, this support amounts to approximately 50% of the total funds needed to operate our hospice. The rest of the funds come from our community, individuals like you. Your donation will help us to continue to provide support to those people in our community living with life-limiting illness or grief. There are several ways you can donate. Donations can be made by credit card, cash or cheque, payable to The Hospice Georgian Triangle Foundation. One-time gifts, recurring (weekly, monthly, annually) gifts or multi-year pledges are most welcome. Please contact our Donor Relations Coordinator, Janet Fairbridge at fairbridgej@hospicegeorgiantriangle.com or 705.444.2555. ext. 7521, if you have questions. Many people will honour a special event such as a holiday, birthday, anniversary or wedding by suggesting that their friends or family make a donation to Hospice Georgian Triangle in lieu of gifts. We can prepare a card to include with your invitation and we will issue a tax receipt and acknowledgement of the donor’s gift. You will also receive a letter outlining all of the gifts we receive. Gifts that involve a donation of stocks, securities, insurance, personal and real property in lieu of cash are accepted by Hospice Georgian Triangle. A tax receipt can be provided for the fair market value of these gifts. Please contact our Donor Relations Coordinator, Janet Fairbridge at fairbridgej@hospicegeorgiantriangle.com or 705.444.2555. ext. 7521, for more information. Planned gifts, or bequests, are major gifts left in a will that are intended for the future without affecting the donor’s current income. There are many different tax advantages to these types of gifts. Donors considering this type of gift are encouraged to speak to their personal financial advisor and lawyer, and then contact Janet Fairbridge in our office to discuss any questions. Planned gifts made to the Hospice Georgian Triangle Foundation are recognized as a part of our Susie Newton Society. Hospice Georgian Triangle (HGT) provides care to your friends and neighbours in the Georgian Triangle where and when they need it most. Please make cheques payable to The Hospice Georgian Triangle Foundation. 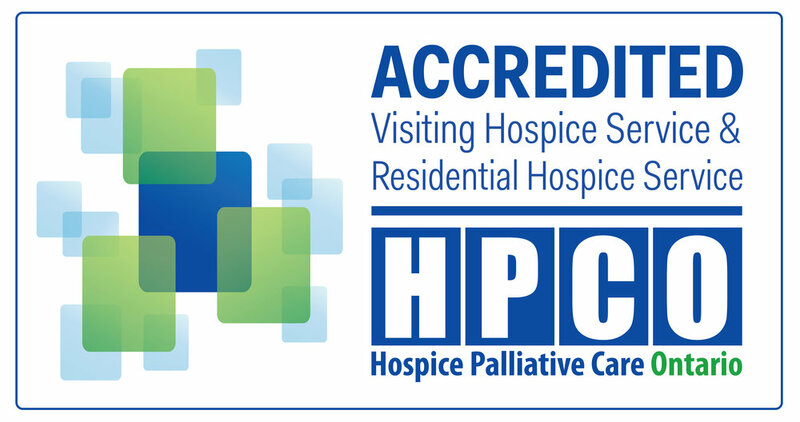 All donations to Hospice Georgian Triangle are processed through The Hospice Georgian Triangle Foundation, charitable registration # 831085089RR0001. Philanthropic donations of $20 or more will be issued an official tax receipt. We are always in need of donations towards our daily kitchen funds. Of course we take direct donations as well...Click HERE to donate to our Kitchen Supplies.